Visit Vietnam's world-famous fishing bay, Ha Long Bay! See eroded grottoes, lush islets, majestic rock formations and teeming marine life all in one trip! Fun and relaxing activity. Food was delicious. The cave was really enormous and beautiful. The steps going up to the cave was worth it. Want to see more of Vietnam's fantastic natural sights? 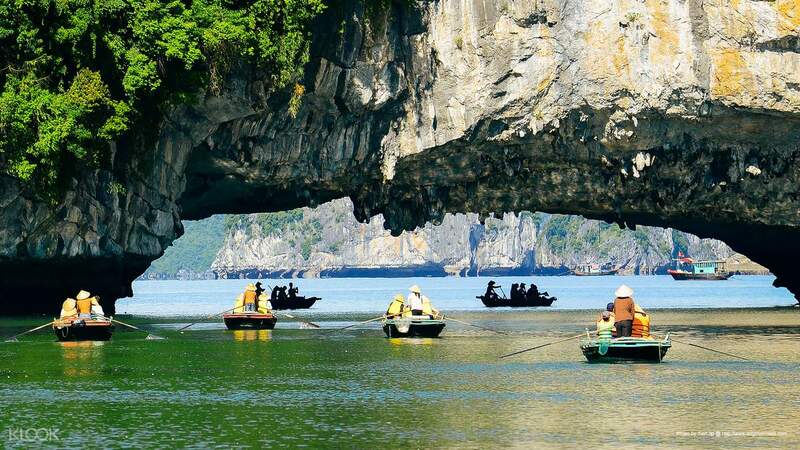 Book this tour for a trip to the world famous Ha Long Bay! Popularly known as a UNESCO World Heritage Site, Ha Long Bay has long been the number one tourist hub in northern Vietnam. Once you see the fishing bay's picturesque landscape of gorgeous islets and towering limestone pillars, you'll understand why. 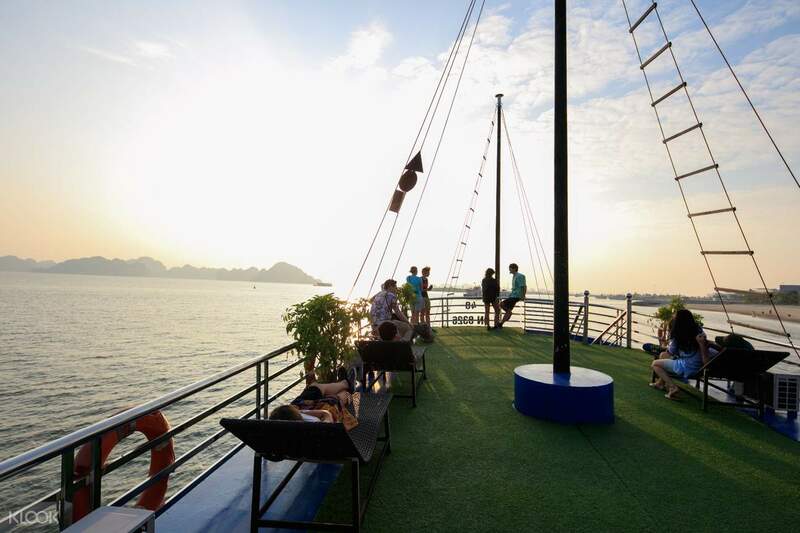 The tour starts with a road trip from Hanoi City to Ha Long Bay, a long drive made comfortable by an air-conditioned shuttle bus equipped with cozy seats. Enjoy relaxing views of the Red River Delta's mountain ranges and lush forests from the comfort of your spacious bus seat. Once you arrive at the pier, not only will you visit the bay itself, but you'll also get to explore the nearby islets and caves on a cruise ship. See popular attractions up close, all while enjoying lunch served by the ship crew. Finish the rest of the tour on a kayak, and enjoy paddling towards fishing villages and majestic rock formations. After kayaking, you'll then head back to the pier. Witness the Vietnamese sunset on the way, and end the tour with a ride back to Hanoi City. Sail through the emerald sea in style on this modern cruise ship! Halong Bay is such an out of the world experience. 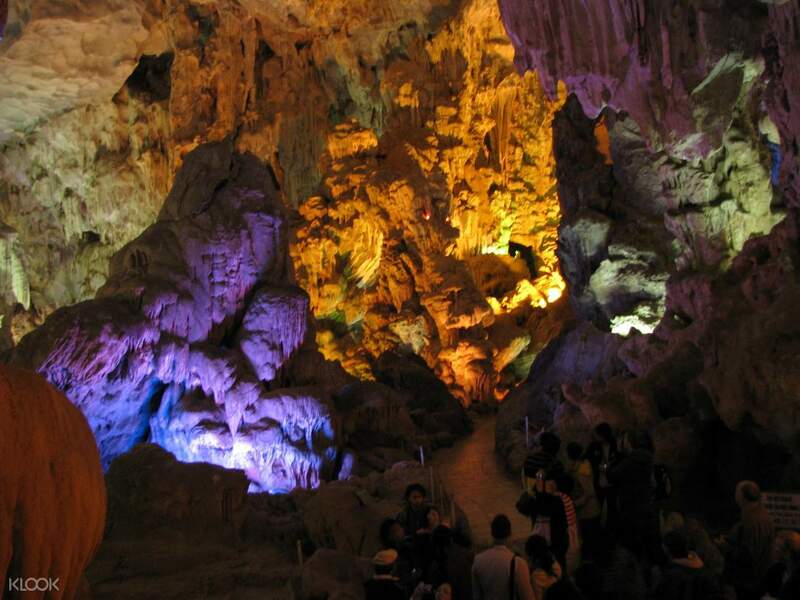 The cave called Heaven Palace is also quite a marvelous experience. Hoan (pronounced Juan) is such a lively, funny and knowledgeable guide. The tedious bus journey is made bearable by him. His explanation of the myths of Halong Bay and Heaven Palace is very interesting. I think this tour is more than worth it. However bring more water and snacks along the way as the reststop is selling at 3 times the price in Hanoi. The lunch served on the boat was a bit blamd but hey, we are not there for the food are we? Highly recommended. Halong Bay is such an out of the world experience. The cave called Heaven Palace is also quite a marvelous experience. Hoan (pronounced Juan) is such a lively, funny and knowledgeable guide. The tedious bus journey is made bearable by him. His explanation of the myths of Halong Bay and Heaven Palace is very interesting. I think this tour is more than worth it. However bring more water and snacks along the way as the reststop is selling at 3 times the price in Hanoi. The lunch served on the boat was a bit blamd but hey, we are not there for the food are we? Highly recommended. Absolutely great day had. Thung is a very capable and likable guide which ensured that all the arrangements rang like clockwork. The bus that we were transported in was modern and all worked well, the driver was also competent. Was a long day as we were picked up at our hotel at 08:00, and dropped of at approximately 20:45. The boat that we were allocated was in good condition and the food was delicious and plentiful. The drinks were cold and I must admit we had a few. All the activities were great, thoroughly enjoyable and this excursion is highly recommended. Absolutely great day had. Thung is a very capable and likable guide which ensured that all the arrangements rang like clockwork. The bus that we were transported in was modern and all worked well, the driver was also competent. Was a long day as we were picked up at our hotel at 08:00, and dropped of at approximately 20:45. The boat that we were allocated was in good condition and the food was delicious and plentiful. The drinks were cold and I must admit we had a few. All the activities were great, thoroughly enjoyable and this excursion is highly recommended. Awesome tour! Our tour guide (Tam aka Tom Cruise) was really knowledgeable and helpful throughout the tour! He was funny and he make sure everyone of us enjoy and understand the history of Halong Bay.. Highly recommended and worth the money ! Awesome tour! Our tour guide (Tam aka Tom Cruise) was really knowledgeable and helpful throughout the tour! He was funny and he make sure everyone of us enjoy and understand the history of Halong Bay.. Highly recommended and worth the money ! Amazing deal from klook. Its a great value for your money. This tour is beyond from what we expected. Long, our tour guide is a great host, he explain further what are we going to expect in the tour. He is also approchable. 2 thumbs up for him. The lunch meal was delicious. Sumptuous meal. Halong bay is very beautiful place and the Dau Go Cave was magnificent. I will truly recommend this tour package. Amazing deal from klook. Its a great value for your money. This tour is beyond from what we expected. Long, our tour guide is a great host, he explain further what are we going to expect in the tour. He is also approchable. 2 thumbs up for him. The lunch meal was delicious. Sumptuous meal. Halong bay is very beautiful place and the Dau Go Cave was magnificent. I will truly recommend this tour package. As usual, buying tour activities from klook is hassle free and worth it! Buying this trip from klook will be very convenient to you compared to commuting. The trip to and from ha long bay took around 7 hours. The Tour guide is very friendly, entertaining, and helpful. The bus used was very comfortable despite the long drive. Included lunch was filling. Thanks klook for another great tour! As usual, buying tour activities from klook is hassle free and worth it! Buying this trip from klook will be very convenient to you compared to commuting. The trip to and from ha long bay took around 7 hours. The Tour guide is very friendly, entertaining, and helpful. The bus used was very comfortable despite the long drive. Included lunch was filling. Thanks klook for another great tour! The tour is amazing. We think it is affordable given the inclusions on this tour. Circ, our guide, is good and informative. The food on the lunch meal is also good. I think my favorite was the chicken. But you would need to pay for your drinks. On the tour, you'll get to see the cave, and ride a boat (or kayak on your own) to see the natural rock formations on Halong bay. Stopovers are also great, since you'll see handmade artworks from Vietnamese artisans. The transportation is also good; the driver is careful and fast enough to get to our destinations on time. The only downside was that we thought we were left behind, since it has been past 9AM (8:30AM is the meeting time) but we were not picked up yet. Circ explained that there had been sudden changes on hotel pick ups of the other guests, causing the delay. It would be better if they have at least communicated through email that there will be slight delay. 😁 But all in all, it is a great tour, and highly recommended. The tour is amazing. We think it is affordable given the inclusions on this tour. Circ, our guide, is good and informative. The food on the lunch meal is also good. I think my favorite was the chicken. But you would need to pay for your drinks. On the tour, you'll get to see the cave, and ride a boat (or kayak on your own) to see the natural rock formations on Halong bay. Stopovers are also great, since you'll see handmade artworks from Vietnamese artisans. The transportation is also good; the driver is careful and fast enough to get to our destinations on time. The only downside was that we thought we were left behind, since it has been past 9AM (8:30AM is the meeting time) but we were not picked up yet. Circ explained that there had been sudden changes on hotel pick ups of the other guests, causing the delay. It would be better if they have at least communicated through email that there will be slight delay. 😁 But all in all, it is a great tour, and highly recommended. Expect what you've booked for & awesome experience. They hotel picked up us and drop to our hotel in old quater on time, the guide is good in english which make the trip much better, we took a 4 hours travel to halong bay with 30 mins stop the bus is comfortable as well. 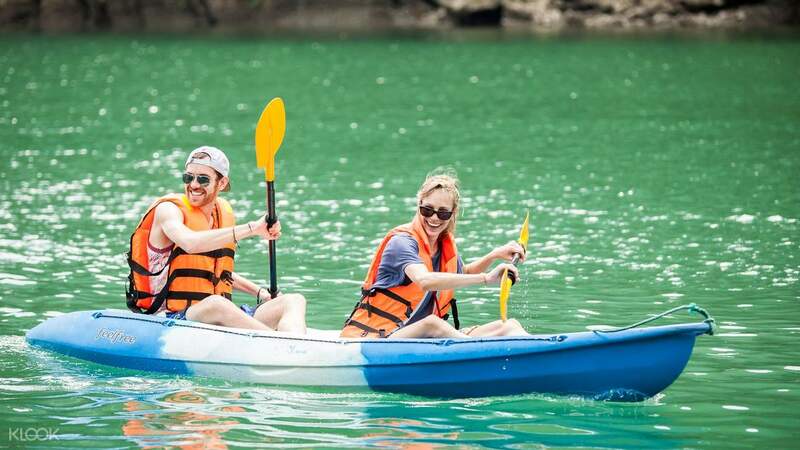 The best part was when we reach the harbour, we cruised the bay while the guide discuss the history of the place, activities is well organize lunch, kayaking and cave. Most importantly is the safe feeling, our tour guide has an eye on everything :) because most of the time we did our own thing you know the adventure seeker type :)) he let us have our short time on every stops to do what we need to do and for that we really had our time and didn't felt that it was a group tour. Expect what you've booked for & awesome experience. They hotel picked up us and drop to our hotel in old quater on time, the guide is good in english which make the trip much better, we took a 4 hours travel to halong bay with 30 mins stop the bus is comfortable as well. The best part was when we reach the harbour, we cruised the bay while the guide discuss the history of the place, activities is well organize lunch, kayaking and cave. Most importantly is the safe feeling, our tour guide has an eye on everything :) because most of the time we did our own thing you know the adventure seeker type :)) he let us have our short time on every stops to do what we need to do and for that we really had our time and didn't felt that it was a group tour. Best halong bay tour deal! We used a big bus to get to our destination. Tour guide has a very good sense of humor and he is very experienced and attentive. Dishes served for lunch are good too. Boat is clean and toilet is decent. Worth every penny! Best halong bay tour deal! We used a big bus to get to our destination. Tour guide has a very good sense of humor and he is very experienced and attentive. Dishes served for lunch are good too. Boat is clean and toilet is decent. Worth every penny!